Even before Charles Buek & Co. started construction on three upscale homes on Madison Avenue in 1885, two had already been sold. The sites of the planned Queen Anne-style houses were on the east side of the avenue, from the northeast corner of 69th Street to No. 833, two doors to the north. William C. Lane had purchased the corner mansion, completed in 1886. With an ample frontage of 27 feet along Madison Avenue, the house stretched along 69th Street for 65 feet. The architects placed the entrance on the side street, with the address of No. 19 East 69th. The arrangement allowed for greater flexibility and more generous proportions of the interior layout. The English basement and parlor floor levels were clad in undressed fieldstone, in contrast to the tidy brick upper floors. Here openings were framed in dressed brownstone. The fourth floor supported a steeply-angled hipped roof interrupted by sharply pointed dormers. Exaggeratedly tall, paneled brick chimneys erupted from the roof. Lane was a wealthy and respected businessman, highly involved in the exclusive Union League Club. The Vice President of the United States Cordage Company, he was also an officer in the Chicago Junction Railway and Union Stock Yards Company. Lane’s United States Cordage Company would suffer heavy losses, eventually failing in 1895. It was possibly this situation which prompted him to sell No. 19 East 69th Street only two years after moving in. On October 6, 1888 the Real Estate Record & Builders’ Guide reported that he had sold it to another railroad mogul, John King, for $87,500 (about $2.25 million in 2015). The 56-year old King’s rise to the Presidency of the Erie Railroad was inspiring. The New York Times would later remember “He received only a common school education.” His uncle, John W. Barrett, was the head of the Baltimore and Ohio Railroad and gave the boy a job as ticket seller in a suburban station. King remained with the Baltimore and Ohio for 27 years, receiving small promotions until he became First Vice President. In 1881, now wealthy and influential, he retired because of ill health and took his family to Europe for three years. While there, William H. Vanderbilt sent King a telegram, offering the presidency of a railroad, which he declined. But in 1883 Vanderbilt convinced him to return to America to manage and rehabilitate the Erie Railroad. A year later, in November 1884, he was elected President. Through his remarkable executive abilities the Erie Railroad was reorganized and returned to profitability. The Kings were highly visible in visible in social circles, owned another town home in Baltimore and a country estate in Maryland. The Times noted that he was “a member of fully twoscore of clubs and associations, both public and private, in this country and in Europe.” His Manhattan memberships included the Century Club, the Metropolitan, the Manhattan, the Lawyers’ Club, the New York Whist Club, the Tuxedo, and the Southern Society. Despite the uptown location of their new mansion, the Kings remained members of the fashionable St. George’s Episcopal Church on Stuyvesant Square. John King was at one time a vestryman of the church, of which his close friend, J. Pierpont Morgan, was a warden. The girls were preparing for a six-week retreat beginning on June 6, 1894 at St. Gabriel’s Episcopal Convent at Peekskill, New York. Helen and Daisy were indeed trailblazing the “fad.” The newspaper estimated that “nearly 150 women” were expected to do the same later. “While at the convent the young women will submit themselves entirely to its rules, taking part in its continuous services and prayers,” reported the newspaper. Life would be considerably different from Helen’s normal Manhattan routine that required her familiarity with fish knives and oyster forks, the proper deportment during a promenade, and which costumes to wear before lunch and after dinner. A year after the article appeared, John King’s health forced him to resign from the Erie Railroad in May 1895. That same month he sold the mansion to Edward Copeland Wallace for $85,000. He took his wife and Helen to Europe in hope that his health would improve. Unfortunately, his worsening condition prevented the “leisure tour” he had hoped for; and he died in Beaulieu near Nice on Wednesday, March 17, 1897. 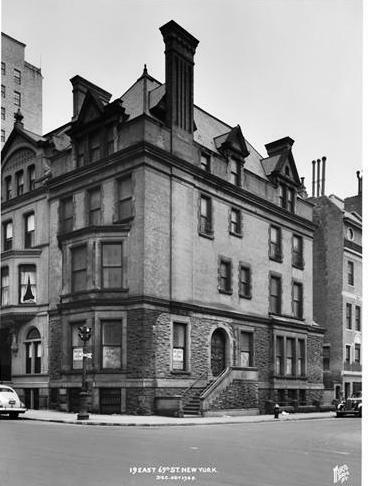 Edward Copeland Wallace and his family moved into the 69th Street mansion from Brooklyn, where they had been active in society. Called by The Evening World a “millionaire iron magnate,” Wallace would find himself in serious trouble following an accident near Nyack, New York on May 29, 1902. The Wallaces maintained a country estate in fashionable Tuxedo Park. That afternoon Wallace was behind the wheel of his roadster, heading there with his son in the car. Also out that day were wealthy lawyer Edward T. Lovatt and his wife, whose country home was in Spring Valley, New York. The Lovatts were taking a casual afternoon drive to Nyack in their wagon. As they approached a crossroads, Lovatt later testified, “I saw an automobile coming down from the top of the hill at a rapid rate.” That “rapid rate” was later estimated to be 30 miles per hour—a shockingly fast pace in 1902. Mrs. Lovatt was terrified and screamed “Please, stop!” But the Wallace automobile continued. Lovatt’s horse reared, becoming uncontrollable. It galloped up an embankment, tossing Mrs. Lovatt out of the vehicle first, and then Edward Lovatt as the wagon overturned. According to Lovatt’s testimony on June 7, Wallace “paid no attention, and laughed as he whizzed by.” Mrs. Lovatt (deemed by the New-York Tribune to be a “heavy woman") lay unconscious by the road, seriously bruised and with one arm broken. Lovatt’s injuries were less severe and, according to the Tribune, “after he had cared for his wife, set out to bag the offending chauffeur.” The lawyer went to a telephone and called the West Nyack Hotel. He described the automobile and instructed the hotel to stop it. Determined, Lovatt called the next hotel down the road, Knapp’s Hotel. This time he was in time and Wallace was stopped. But the tycoon glibly explained that no one was injured in the accident, left his business card, and preceded onward toward Tuxedo Park. And there was also the issue of a $25,000 suit filed by Mrs. Lovatt for damages. Although Lovatt produced eye witnesses, David Summers and his wife; Wallace’s attorney moved for a dismissal “on the ground that the offence [sic] with which Mr. Wallace was charged had not been proved.” The motion was denied. The same year that he endured the court appearance, Wallace’s brother General William Copeland Wallace died. His death prevented the debut of his daughter, Helen. Two years later, after the expected period of mourning, she was feted with several lavish entertainments. One of these was a debutante dance at the Metropolitan Club in January 1904 hosted by the Edward Wallaces. In November the following year Edward Copeland Wallace sold the East 69th Street house to 36-year old society dentist Wilber M. Dailey. He and his wife, the former Cora I. Fletcher, had one son, Wilber Jr. The dentist practiced in partnership with his brother, Dr. Washington Dailey. Their high class clientele was exemplified by their working on the teeth of Prince Louis of Battenberg in 1905. The prince would certainly not be Wilber M. Dailey’s last, nor most illustrious patient. He was, for instance, the personal dentist to President and Mrs. Franklin D. Roosevelt. Wilber M. Dailey lived at No. 19 East 69th Street for over three decades. He died in the mansion on Saturday evening, February 27, 1937. Exactly how much longer Cora remained in house is unclear; however in 1946 it was converted to apartments—the first step in a series of architectural degradation. By 1951 stores had been installed at street level and the apartments above were operated as the Congress Hotel. Excitement occurred in 1952 when 40-year old Gerhard Puff and his 17-year old wife, Annie Laurie, arrived in town and headed here. Puff was a well-known bank robber whose photo appeared on the FBI’s Ten Most Wanted List. Not long after the couple arrived at the Congress Hotel, agents stormed the building. Puff attempted to sneak down the stairs and finding himself face-to-face with a FBI agent, shot and killed him. The murder bought Puff an execution in the electric chair on August 12, 1954. That was the year that the City Gardens Club opened its offices here. The club would remain in the building at least through 1971. Meanwhile, upscale shops came and went at street level. In 1960 the Champagne Shop opened on the 69th Street side; while the New Masters Gallery faced Madison Avenue. Since around 1980 Pratesi Linens has called the retail space home. The upscale tenor of the shop is reflected in the $835 price tag for a Belle de Jour sheet set in 2001, and a $2,800 Chain jacquard sheet set marked down to $1,260 in 2013. Almost all traces of Charles Buek & Co.'s imposing Queen Anne mansion below the third floor have been obliterated. But by looking up, the passerby can get a glimpse of the home where a railroad mogul, an iron tycoon and a celebrity dentist lived in sumptuous style. "Morgan was a member of the Union Club in New York City. When his friend, Erie Railroad president John King, was black-balled, Morgan resigned and organized the Metropolitan Club of New York. He donated the land on 5th Avenue and 60th Street at a cost of $125,000, and commanded Stanford White to "...build me a club fit for gentlemen, forget the expense...". He invited King in as a charter member and served as club president from 1891 to 1900."